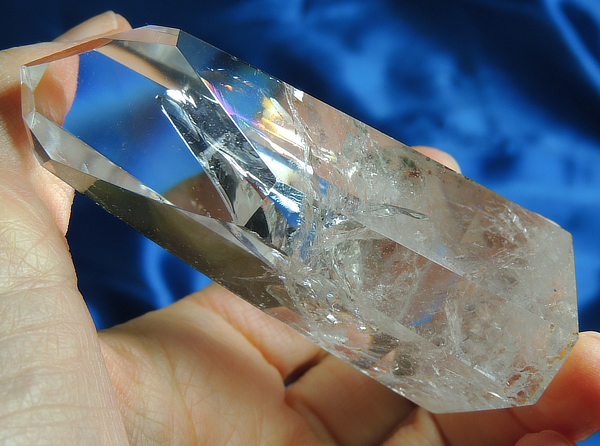 This is a wonderful polished quartz crystal that is more clear than he appears at first, due to the number of internal foils. He is 3.5 oz, 2.9” by 1.3” by 0.9” from Brazil and is actually a Rescued Rosie that was totally polished and with rare red chlorite in the base. When my supplier was visiting his supplier in Brazil, he noticed this pile of damaged tangerose crystals that were headed for uncertain futures, so my supplier suggested that these be polished! What a perfect solution as these amazing quartz have SO much to offer and with their energies restored, they are truly extraordinary! My dear friend, Jenny, calls the tangerose quartz, ‘Rosies’, and these Spirits are then ‘rescued Rosies’, wonderfully recovered and transformed – human and crystal, working together! However, with this crystal, no color remains save for one unpolished face. His color expresses itself, however as delightful rainbows that appear as you turn him in the light! He is truly exceptional and will bring his Keeper much joy!